Shiva may no longer be the antler-anihilator she once was but we still have to work hard to keep her toys intact for longer than five minutes. 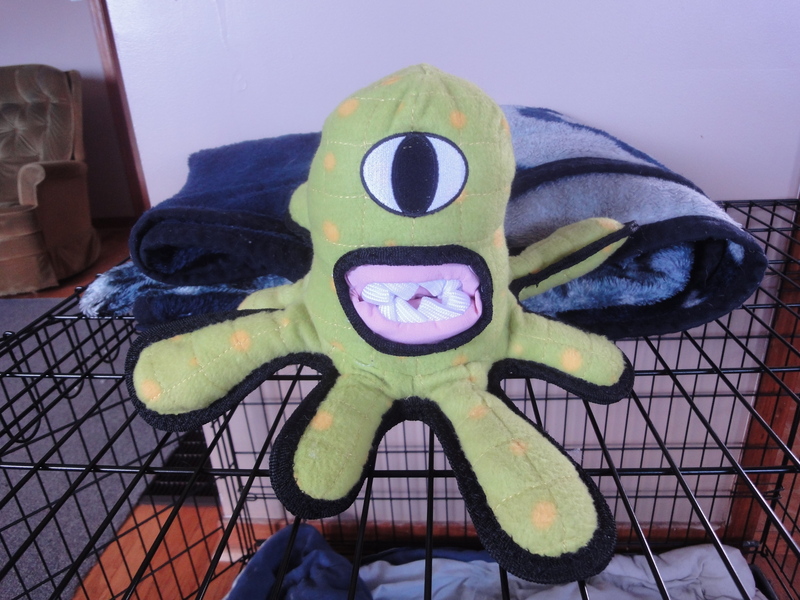 Below is a picture of the alien Tuffie toy we bought for her Gotcha Day. This was taken before she first got her teeth on it. Quite impressive stitching, don't you think? I am thrilled the toy resembles its original form. Green Alien Man has not lost a single body part in over fourteen days! It is completely unprecedented. That's right, my PH can sew. Our home is now an official safety zone for dog toys. No more will they cower in fear when we enter the store. Once word gets out, toys will be fighting for the chance to come home with us. Don’t worry toys. There will be no more mindless violence under our watch. Shiva’s murderous ways are over. Well, as long as we’re in the room anyway. If a toy “just happens” to fall off the shelf when we’re not around… Green Alien Man is on his own. How’s that going?? 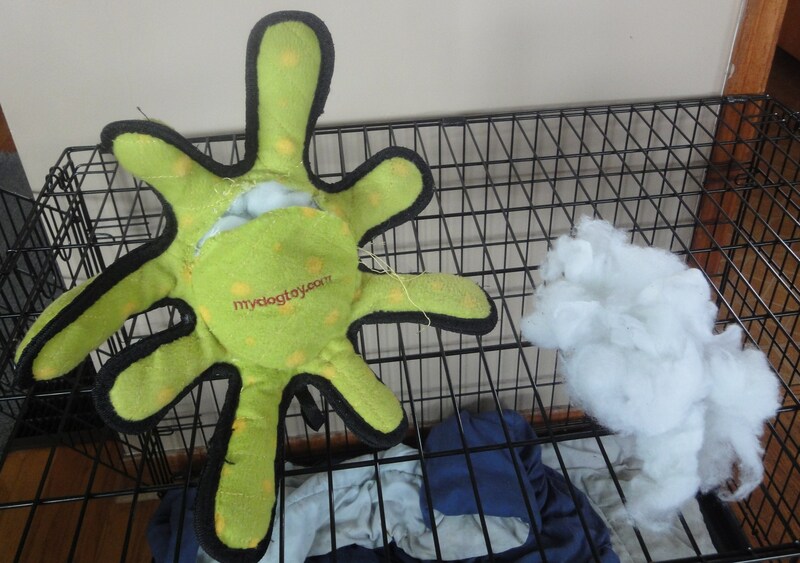 Lenny destroys every stuffed toy… if not in a matter of hours, it’s just a matter of days. Is she being more gentle or are you just managing better? Oh the joys of the beast. Giving Elka a stuffed toy means 10 minutes or so typically. Granted, I haven’t shelled out for one of the super cool ones like that; maybe it could stand a supervised ten minutes. A good lesson, though. Toys need not perish! That’s why I try to avoid getting stuffies with a lot of filler. Otherwise, I’d be picking up fluff for hours. I love tuffie brand toys. Although I love the look of their “cute” toys, i’m a big fan of their simple ring toy and have had good luck with it surviving (with some help by me being careful to lot let it become a ‘chew’ toy). That alien is SUPER cute! Well now you are taking all of the fun out of having stuffies. 🙂 I usually won’t spend very much money on the stuffy, I know they will destroy in fairly short fashion. Of course on their birthdays I spend a bit more, and sometimes the toys don’t last. Sometimes I just restuff the toys (without sewing) and let them pull it out again, but good for your PH for restuffing and resewing the toys. 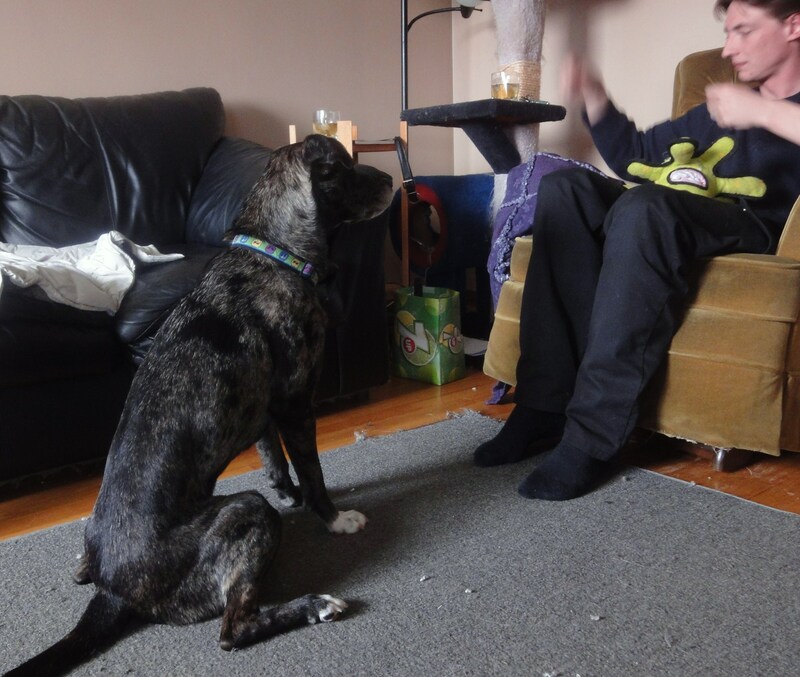 I love that pic of Shiva waiting patiently for the PH to finish sewing. Priceless! We do a lot of that here too! I have a whole collection of toys in the hospital, really should keep them more handy so I sew while I watch TV or something. Luna is pretty good about making toys last though, especially if it has a squeaker as then she just plays with it… and it it is fury she love bites it more than chews it. Guess I have gotten better at picking toys too. 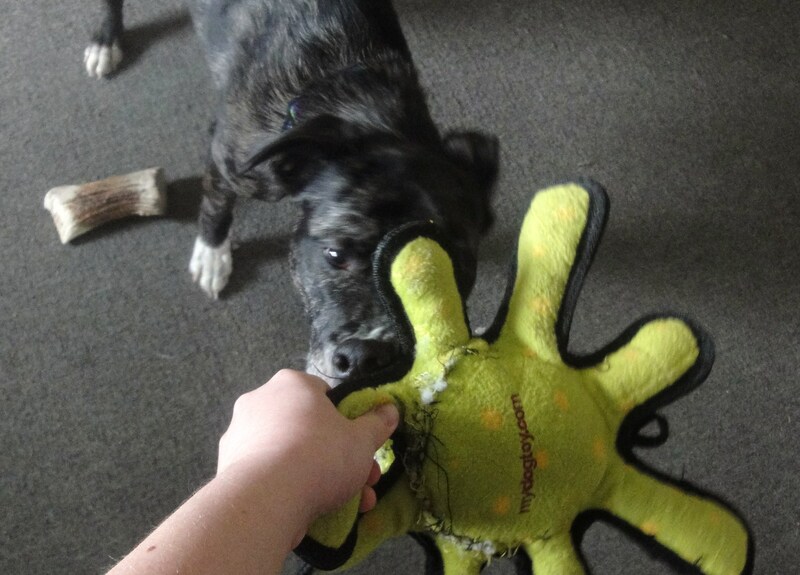 As I mentioned to Flo’s owner you may want to check out Kyjen dog toys… they have all sorts of tuff and cool toys. Go Dog is another good brand with double chew guard fabric layers and double stitching… and We have quite a few Hugglehound toys laying around here too. Good work with Shiva and her toys!! you are proof that it can be done. 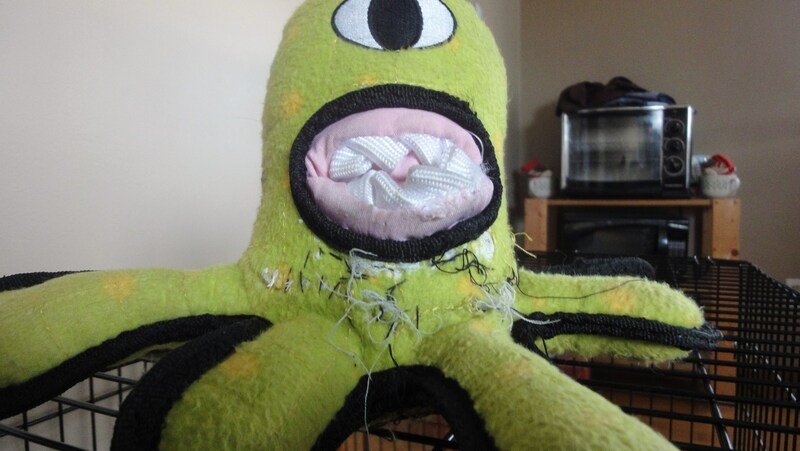 Actually many toys are alien creatures bent on destroying the world and only the dog can save us from them. Cooper destroys toys so fast that I’ve started putting all stuffies away until he’s at doggy daycare, then getting them out for Emmett and Lucas to play with in peace! How on earth did you get her to be gentle with them?? Awwww come on! 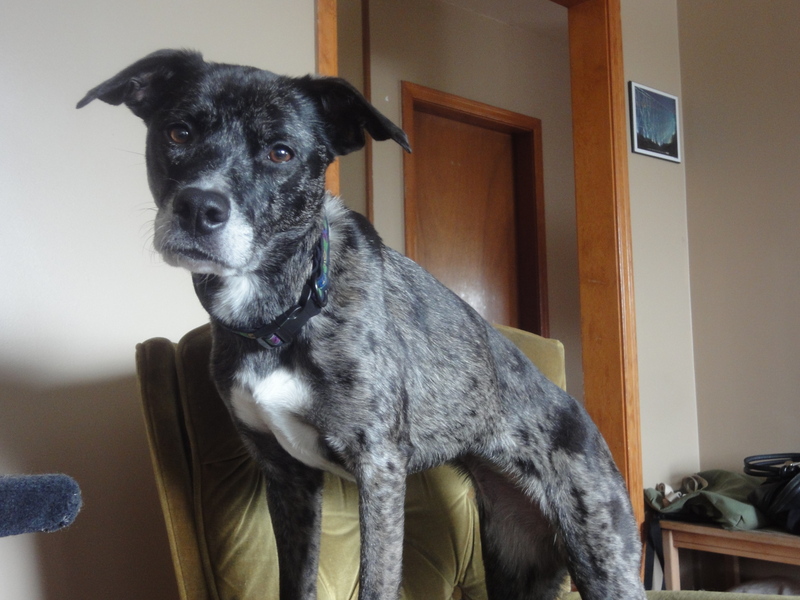 Shiva’s humans wou;dn’t stop her from a perfectly satisfying stuffie hunt and murder…WOULD THEY?! 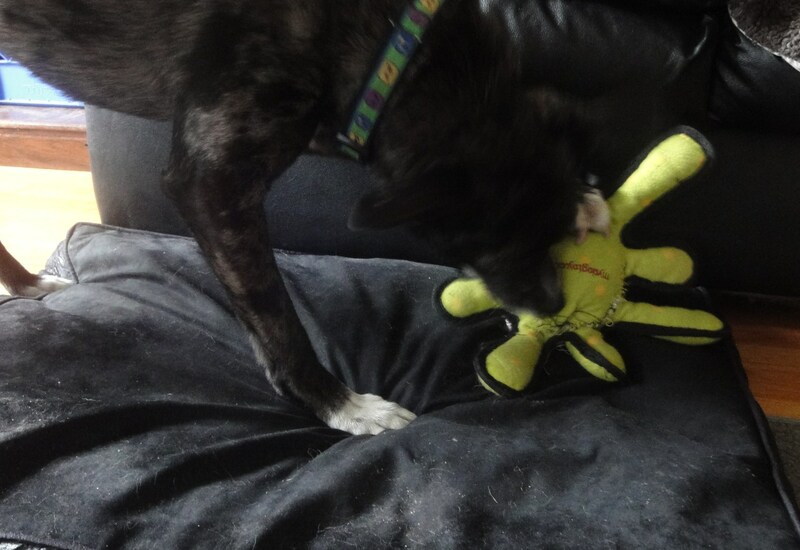 One of Kol’s great joys in life is killing a toy – although, somehow the Felix has designated a large number of those toys as his and Dog help Kol should he destuff one. Felix is badass, man. Every other bit of news in this post has just flown by me because I’m still stuck on the caption that reads…PH can sew. Could you please, please clone him and send me one?